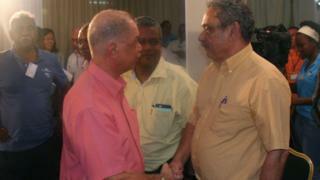 President James Michel of the Seychelles has said he will stand down next month after 12 years in office. The 72-year-old was re-elected for a third term in December with a slight majority. But his party lost parliamentary polls earlier this month, after 39 years in power in the Indian Ocean archipelago. He is due to resign on 16 October, and to be replaced by Vice-President Danny Faure, who can serve only two terms under a new constitutional amendment. "After 12 years as president, the time has come to hand over the reins of power," Mr Michel said in a televised address. "A new leader who will take Seychelles to the next frontier of its development." Does Seychelles live up to its idyllic image? In polls earlier this month the opposition coalition of the Seychellois Democratic Alliance won 15 parliament seats against 10 for Mr Michel's Parti Lepep, known as the People's Party. The opposition had argued the country needed change, while the governing party claimed it would offer economic stability for the islands, which depend on tourism and fishing. Parti Lepep has been in power since a coup in 1977, a year after independence, and it had won a majority in every election since the return of multi-party politics in 1993.